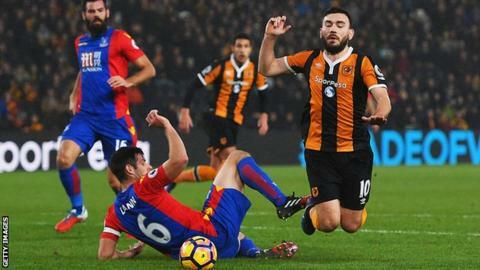 Hull winger Robert Snodgrass apologised for winning a spot-kick in the 3-3 draw with Crystal Palace, insisting it "was never a penalty". The Scotland international gave Hull the lead from the spot after he went down in the area, despite there appearing to be no contact from Palace defender Scott Dann. Palace manager Alan Pardew said Snodgrass should be "embarrassed". "The player has really fabricated that," he added. Snodgrass was already on a yellow card when he won the penalty, and would have been sent off had referee Mike Jones thought he dived. "Apologies from my end, it was never a penalty," tweeted Snodgrass after the match. "But genuinely thought defender was going to slide, so tried to ride the tackle." Manager Mike Phelan added: "The ref made the judgment and we've had many appeals turned down this season, so I am not going to complain." Palace needed a late equaliser from substitute Fraizer Campbell to earn the draw at the KCOM Stadium. The result leaves Hull in 19th place on 12 points, with Palace dropping to 15th, just three point above the relegation zone. BBC Match of the Day pundit Danny Murphy said "unless you have retrospective punishment for obvious offences like this, it will continue". Ex-Palace striker Ian Wright said on MOTD: "Robert Snodgrass dived. He's just gone down. He's expecting Scott Dann to tackle him, but he's not tackled him. "When you're under the kind of pressure Alan Pardew is under you need luck. Palace need the referees to do their bit." Rugby union referee Nigel Owens told BBC Radio 5 live footballers who dive should be punished. "If a player is found to be guilty, I don't think a fine would make any difference," he said on 606. "Then you ban the player depending upon the seriousness of the offence. "Citing doesn't stop the flow of the game, and I think it would be hugely beneficial. When a player does the dive, I think it's very difficult for the referee to make a decision at that time. "If you had the citing, it would be highlighted afterwards and they can look at it and say 'right, this guy definitely has dived, and we'll deal with him accordingly' and I think that would get rid of a lot of the problems."